LOS ANGELES—If a good deal comes along with good yield and credits that you can get comfortable with, whether the deal is in a secondary or tertiary market isn’t the main focus. That was according to panelists on the “Investment and Transaction Outlook panel at RealShare Net Lease West on Thursday. Los Angeles Non Rent Controlled Apartments reached a milestone gross rent multiplier (GRMs) of 15 times rental at the end of the second half of 2015 according to the Hanes Company. Cap rates for all apartments fell to 4.66% at the end of the second half of the year. Since the reported expenses for most small apartments are unreliable, I have used the GRM as a more accurate index. GRMs on the Westside are reported at 17 to 21 times rental. My own comps that track Echo Park and Silver Lake show GRMs at between 14 to 15 times rental from 10 to 12 times rental a few years ago. My research can find no GRMs this high or cap rates this low going back to the 1920s. A Los Angeles Times article from 1998 reports a Grubb Ellis Survey showing 1998 GRMs at 5.75 times rental. The previous peak occurred in the second half of 2006 when GRMs reached 14 times rental, according to Hanes Company data. We are at the apex of the perfect storm driving these yields. First, interest rates are also at historic lows. Investors are starved for yield. Second, we are witnessing the move of highly educated young people and tech/media/biomed companies to certain urban cores. “Unlike previous generations, today’s college graduates younger than 40 — the nation’s largest demographic — are moving in droves to neighborhoods in San Francisco, Seattle or New York, Portland economist Joe Cortright said. Companies are also increasingly setting up in or near city centers, offering well-paid jobs to those graduates, Cortright said. As more people move to urban cores, they’re competing for a limited number of rentals. Housing construction is still lagging behind pre-recession levels, data show. (Los Angeles Times , November 15, 2015). However, despite these trends, one has to reflect whether to buy at these levels reflects value investing or shrewd marketing timing. 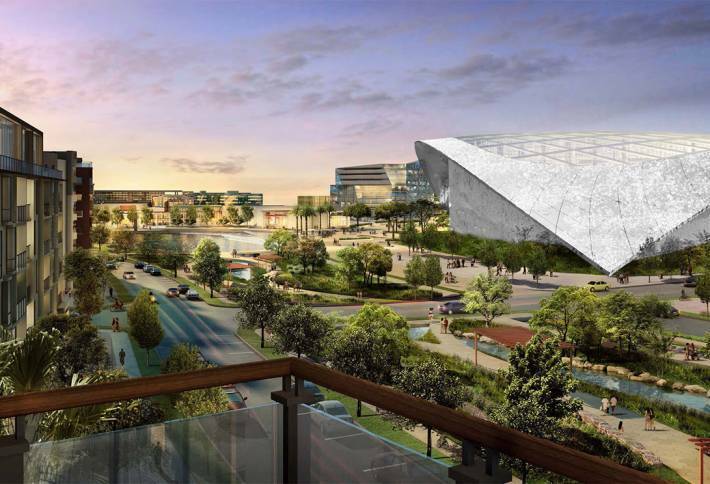 Carson’s proposed NFL stadium got a boost Monday, when the FAA released a preliminary report that poses challenges for Inglewood’s proposed $1.8B NFL stadium project. The report stated that the stadium’s location is “presumed to be a hazard to air navigation” and warned that the stadium could interfere with radar that tracks inbound planes to LAX. The report stated that the configuration of the stadium between two runways, coupled with the uncertainty of its reflective properties, is the FAA’s main objection to the stadium. The findings offer the developer, St. Louis Rams owner Stan Kroenke, solutions for overcoming this issue, including reducing the stadium’s height by more than 100 feet and reshaping the exterior or covering some surfaces with material that absorbs radar or isn’t reflective. But this would add additional costs and time to the 290-acre mixed-use project, which has already been designed and entitled, and site work to prepare for construction is nearing completion. This week Carson’s stadium developer, Carson Holdings LLC, a JV of the San Diego Chargers and Oakland Raiders, announced that The Walt Disney Co CEO Bob Iger had been tapped to lead the proposed Carson NFL stadium effort. This was a coup for the Carson stadium backers, since Disney owns ESPN, and Iger already has a working relationship with many NFL owners and Commissioner Roger Goodell. Vancouver-based Onni Group has acquired 800 Wilshire, a 16-story office tower in the heart of downtown Los Angeles’ Financial District. The the 227k sf high-rise, located at the corner of Wilshire and Flower St, was sold by joint venture partners Lincoln Property Company and Angelo, Gordon & Co. Since acquiring the property in 2013 from Prudential Real Estate for around $48 mil, Lincoln has upgraded the common areas to cater to creative office users, improved the aesthetics of the building and recruited new retailers on the ground floor. During this time, occupancy soared from 65 percent to 95 percent. With the inclusion of new companies, including Cross Campus, the tenant mix includes a wide range of industries, including technology-driven businesses migrating Downtown. 800 Wilshire was constructed in 1972. Prior to Lincoln’s acquisition, the most recent renovation was in 2004. The building includes three levels of subterranean parking as well as unique office space on the 2nd and 16th floors, which feature high ceilings and outdoor balconies overlooking the downtown skyline. Lincoln’s upgrades included renovation of the main lobby, with a focus on enhanced lighting and new finishes, and implementation of an open-ceiling model that meets the creative office standard, among other improvements. Lincoln also brought ground-floor retail space to life with the addition of 800 Degrees Pizza. 800 Wilshire is strategically located in the heart of Downtown’s financial core, in close proximity to Staples Center and L.A. Live, Bunker Hill, the new and continually expanding “restaurant row” on 7th Street, and to new apartment developments in the historic core, South Park, and City West. 800 Wilshire also has direct access to a robust transportation network including the Harbor and Santa Monica freeways, the Metro rail system and the Downtown Dash Bus. Marc Renard, Vice Chairman of Cushman & Wakefield’s Capital Market Group, represented both parties in the transaction. The price was not immediately disclosed. According to Dominic Cerminara, of Kingsbarn Realty Capital, cap rates in the net lease sector have seen immense pressure, thanks to the extreme demand and competition for product, but that may be changing. Recognizing LA’s high risk for earthquakes, the LA City Council last month enacted the strictest seismic regulations in the nation. The new law requires an estimated 13,000 “soft-story” wood-framed buildings be seismically strengthened. These are typically apartment buildings with soft, weak or openfront wall lines. The ordinance also includes about 1,500 “non-ductile concrete” buildings considered vulnerable to earthquake damage and potential collapse. Seismic building retrofits are estimated to cost $60k to $250k for wood structures, but could be millions for large concrete apartment towers. Third-party lending options that link construction loan repayment to property tax payments provide some relief for owners, the most notable of which is the AllianceNRG PACE program, but several other LA lenders have also been approved. Currently, landlords can push rents up $75/month to cover repairs, but the City Council has proposed splitting costs between owners and renters, but limiting rent hikes to $38/month.